Santa Clara County Dems are on edge in the wake of bomb threats targeting high-profile party officials. Silicon Valley Democrats are staying vigilant and taking safety precautions in response to a spate of bomb threats targeting Democratic Party officials throughout the country. Staff at the Santa Clara County Democratic Party headquarters off of Moorpark Avenue in San Jose plan to keep the door locked for the time being. Visitors who want to come in will have to knock and identify themselves to whoever’s inside. Judy Pipkin, the outreach coordinator for the local party, said they bought a doorbell this morning and will make sure all volunteers go through safety training. “The main thing is that the Democratic Party does not back down to the fear and hate,” she told San Jose Inside. The California Democratic Party sent a similar warning. 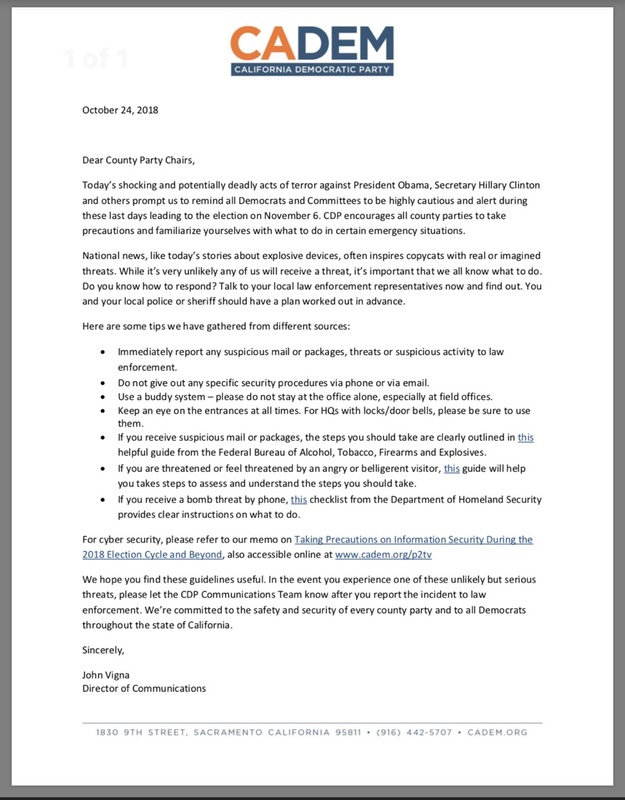 In a letter sent to county chapters, Cal Dem spokesman John Vigna told members to be on high alert in the days leading up to the Nov. 6 election. John Lynch, a volunteer who answered the Dem Party’s office phone today when San Jose Inside called for comment, said the mood was a little tense this morning. On Tuesday, the Democratic National Committee’s headquarters in Washington D.C. were evacuated in response to a bomb threat. DNC spokeswoman Xochitl Hinojosa said in a statement that the party is working with law enforcement on the matter and would allow workers back in the building today. Suspicious packages with potential explosive devices were sent this week to a slew of other Democratic officials and supporters, including former DNC head Debbie Wasserman Schulz, former president Barack Obama, 2016 presidential candidate Hillary Clinton and Dem mega-donor George Soros. A similar package was intercepted at CNN’s offices in New York City. A host of Democratic lawmakers suggested that President Trump’s divisive rhetoric inspired the sender to target party officials. U.S. Sen. Dianne Feinstein (D-San Francisco) said on Twitter that leaders have a duty to ease tensions, not worsen them. Leaders have a responsibility to calm tensions, not inflame them. I urge everyone to be vigilant in the face of threats and thank all the law enforcement personnel who are protecting government and private sites from attack. Silicon Valley Congressman Ro Khanna (D-Fremont) issued a statement this morning affirming that employees in his D.C. and Santa Clara offices are safe and that no threats there have been reported. “The congressman condemns violence in any form and supports the efforts of law enforcement to apprehend those responsible, hold them accountable and protect every American citizen from further threats,” Khanna’s communications director, Heather Purcell, wrote in an email. The White House condemned the attacks and several high-profile Republican representatives denounced them as political violence and acts of terror. But other conservatives dismissed the bomb scares as a hoax. I wonder if there is some reason why this always happens to Democrats? Republicans never seem to experience these types of threats or targeting. Rep. Steve Scalise would disagree with you. > Rep. Steve Scalise would disagree with you. I don’t think Democrats know about that incident yet. It hasn’t appeared on CNN or MSNBC, has it? And I think the only thing the New York Times has said about Scalise was that he was not directly involved in Russia collusion and has not been questioned by Mueller. > It seems to me that the rhetoric . . . which by the way goes unchecked by members of his own party, leads to calls for political violence. . . .
Are you saying that rhetoric is the same as political violence? I kind of like rhetoric, myself. It’s what allows me to post wisdom on San Jose Inside and gives Jennifer a job. Are you against wisdom, too? Are you against Jennifer having a job? I appreciate your wisdom, Bubble, but it’s not what pays my salary. You get paid for journalism and include the rhetoric for free? Or, are you suggesting that journalism is a rhetoric-free occupation?